You may have read some articles about making million by investing into stocks. This blog don't promise you a quick return. I will also not show you how you make a thousand dollar trade. The core thoughts in this blog are value creation by long-term investing. If you put money for a long period of time into a stock, you will see that your investment is growing. Consider this nifty fact to keep you focused on the long term: $10,000 invested at birth and compounded 10% annually turns into more than $5 million by age 65. 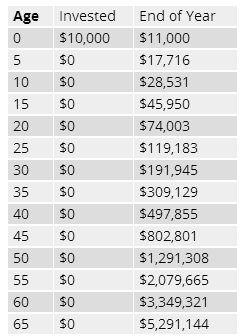 As you can see, a $10,000 investment can easily turn into a fortune if it is left to compound at a reasonable rate of return over the long term. For these calculations, we assumed a 10% average annual rate of return over the long term, which is less than the amount actually achieved by the market as a whole since 1926. Below are five picks that could help you to boost your portfolio return. To qualify for this list, the company must have a long history of dividend increases. We also took into account the sustainability of those dividends and the amount of yield it was providing. We kept total return in mind, looking for companies with excellent earnings and dividend growth rates, as well as sustainable business models. Since investment amounts are likely to be small to start, we limited our selections to companies that do not charge fees for investing through the plan. We also sought to diversify the companies in terms of industry. The companies that met these conditions are listed below. International Paper (NYSE:IP) employs 58,000 people, generates revenue of $23,617.00 million and has a net income of $749.00 million. The current market capitalization stands at $17.26 billion. Twelve trailing months earnings per share reached a value of $2.14. Last fiscal year, International Paper paid $1.45 in the form of dividends to shareholders. Market Valuation: Here are the price ratios of the company: The P/E ratio is 19.42, the P/S ratio is 0.73 and the P/B ratio is finally 3.44. The dividend yield amounts to 4.21%. Exxon Mobil (NYSE:XOM) employs 75,300 people, generates revenue of $394,105.00 million and has a net income of $33,615.00 million. The current market capitalization stands at $338.24 billion. Twelve trailing months earnings per share reached a value of $4.73. Last fiscal year, Exxon Mobil paid $2.70 in the form of dividends to shareholders. Market Valuation: Here are the price ratios of the company: The P/E ratio is 17.17, the P/S ratio is 0.86 and the P/B ratio is finally 1.97. The dividend yield amounts to 3.57%. General Mills (NYSE:GIS) employs 42,000 people, generates revenue of $17,630.30 million and has a net income of $1,175.10 million. The current market capitalization stands at $34.81 billion. General Mills’s earnings before interest, taxes, depreciation and amortization (EBITDA) amounts to $3,417.80 million. The EBITDA margin is 19.39% (the operating margin is 11.78% and the net profit margin 6.67%). Financials: The total debt represents 41.99% of General Mills assets and the total debt in relation to the equity amounts to 184.60%. Due to the financial situation, a return on equity of 21.18% was realized by General Mills. Twelve trailing months earnings per share reached a value of $2.12. Last fiscal year, General Mills paid $1.67 in the form of dividends to shareholders. Market Valuation: Here are the price ratios of the company: The P/E ratio is 27.52, the P/S ratio is 1.97 and the P/B ratio is finally 6.95. The dividend yield amounts to 3.04%. Johnson & Johnson (NYSE:JNJ) employs 126,500 people, generates revenue of $74,331.00 million and has a net income of $16,323.00 million. The current market capitalization stands at $282.12 billion. Market Valuation: Here are the price ratios of the company: The P/E ratio is 19.55, the P/S ratio is 3.80 and the P/B ratio is finally 4.07. The dividend yield amounts to 2.94%. Aqua America (NYSE:WTR) employs 1,617 people, generates revenue of $779.90 million and has a net income of $213.88 million. The current market capitalization stands at $5.12 billion. Aqua America’s earnings before interest, taxes, depreciation and amortization (EBITDA) amounts to $440.89 million. The EBITDA margin is 56.53% (the operating margin is 40.31% and the net profit margin 27.42%). Financials: The total debt represents 30.29% of Aqua America assets and the total debt in relation to the equity amounts to 98.93%. Due to the financial situation, a return on equity of 13.41% was realized by Aqua America. Twelve trailing months earnings per share reached a value of $1.25. Last fiscal year, Aqua America paid $0.63 in the form of dividends to shareholders. Market Valuation: Here are the price ratios of the company: The P/E ratio is 23.11, the P/S ratio is 6.57 and the P/B ratio is finally 3.10. The dividend yield amounts to 2.45%.